Laker Jim: What is your favorite Fletch line? Kevin Smith: "Can I call my mother? Tell her how much I love her?" Laker Jim: How often do you watch Fletch? Kevin Smith: Maybe once a year. Laker Jim: What kind of impact (if any) has it had on your life? 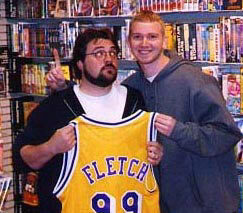 Kevin Smith: When I first saw it in the theater, many moons ago, it made me want to BE Fletch. Laker Jim: Which Fletch Disguise and Alias is your favorite? Kevin Smith: Disguise - Jet Mechanic , Alias - Doctor Rosenrosen. Laker Jim: In an interview with us, Gregory McDonald has said his favorite of your movies is Dogma...Which of the Fletch books is your favorite? Kevin Smith: Hands down, it's "Fletch Won". Laker Jim: Also from my past Interviews, Tim Matheson (Alan Stanwyk), William Sanderson (Jim Swarthout), and R. Lee Emrey (Rev. Jimmy Lee Farnsworth) all have said they would be interested in reprising their Fletch roles in the future. Would this be something you'd consider....Matheson seemed most excited...especially since Alan Stanwyk, I believe, is mentioned in Fletch Won? Kevin Smith: If we can work him in, we will. I'm hoping this flick bridges the chasm between "Fletch" movie fans and "Fletch" book fans. Laker Jim: Since Is Fletch your favorite Chevy Chase movie? Laker Jim: What are some other Chevy Movies that you like...? Kevin Smith: "Vacation", "Seems Like Old Times", "Foul Play", "Spies Like Us". Laker Jim: There have been reports recently that you are about to offer Chevy a part in Fletch Won...As you already know, Fletch fans everywhere want Chevy to at least be associate with it, is the movie progressing to that point where you're gonna offer it to Chevy already? Kevin Smith: I haven't even started adapting the book yet. But there's a plan to work in Mr. Chase as Fletch - perhaps narrating the story of his first adventure. Laker Jim: As teen or now, which one of the "Fletch Girls" did you think was the hottest (or you always wanted to nail)....Dana Wheeler Nicholson (Gail Stanwyk, Fletch) or Julianne Phillips (Becky Culpepper, Fletch Lives)? Kevin Smith: Dana was really quirky and cute in "Fletch". If I wasn't married, and I resided in the fictional world of the "Fletch" movies, and I was given half a shot, I'd probably go for Mrs. Stanwyk. Laker Jim: Besides Fletch, what other characters (from both movies) did you like ? Laker Jim: Are you still as interested in doing Fletch as you first were? Kevin Smith: As long as Jason Lee is playing Fletch, then yes. Laker Jim: LOL, Are you waiting for Chevy to Die to avoid any controversy? Kevin Smith: No - we'll need Chevy for the flick. Laker Jim: If Fletch Won is indeed two years away, will Jason's age impact playing a young Fletch on his first case? (He'd be 34). Chevy was 40 when he made Fletch in '85. Kevin Smith: Yeah, but Lee still looks like a kid. Laker Jim: At what point would you ever pass it off to another director? Kevin Smith: If Miramax says no to Lee starring. Laker Jim: Is there anything else you'd like to say directly to the DIE-HARD Fletch fans out there? Kevin Smith: Patience. It's coming. And Lee won't disappoint. 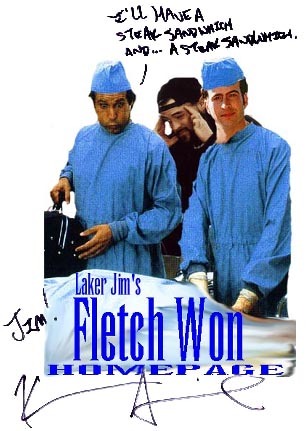 Laker Jim: For my own personal info, Do you visit my site ( www.fletchwon.net ) often? Any suggestions? Laker Jim: Did you ever wear that Jane Doe shirt you wanted that I gave you? Kevin Smith: Not publicly. Not yet. Laker Jim: Thank you so so much for your time. I will be attending Vulgarthon (Day one) and look forward to seeing you there! I'd just like to thank Kevin Smith for taking time out of his busy schedule to answer my questions Look for a "Fletch Won" interview with Mr. Smith when the movie begins production.